Summary: With The Rosie Project, “Graeme Simsion achieved the impossible and created an entirely new kind of romantic hero,” Jojo Moyes, author of Me Before You said. Now Don Tillman returns in the hilarious and charming sequel to the international sensation. Get ready to fall in love all over again. Earlier this year, I reviewed THE ROSIE EFFECT by Graeme Simsion. This novel is the followup to the huge hit THE ROSIE PROJECT (which had around two million readers), and fans of Don Tillman will definitely want to see what happens after he "wins" the girl. Don discovers that life with Rosie is far from simple when they find themselves expecting a baby, and Don does his best to fully research what it takes to be a father. Of course, Don stumbles along the way; and his research methods are a bit unorthodox... and hilarious for readers! 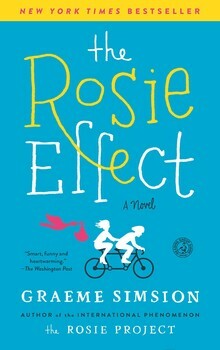 visit www.RosieBooks.com for videos, excerpts, and reading group guides from both THE ROSIE PROJECT and THE ROSIE EFFECT. My book club read THE ROSIE PROJECT last year and had a fun time discussing not only the book but also what we would look for in a partner. I am giving away a copy of the newly released paperback edition of THE ROSIE EFFECT courtesy the publisher. To enter, just fill out the form below before August 4th at 11:59 p.m. EST. I will randomly select and notify the winner the following day. This contest is open to those of you with U.S. addresses only. Good luck! Does this one work as a 'stand-alone' or is it necessary to read the first book for beginning this one? It could work but I think you'd better appreciate Don if you read the first one! I read recently that Jennifer Lawrence is signed on to play Rosie in the movie. Very exciting!